A few years back I wrote about Tom Tierney and his paper doll booklets. Today I received this notice from my sister. With great sadness I must tell you that our dear friend and long time Spoken Word member, Tom Tierney, died yesterday, July 12. He was 86, but wouldn’t want that spread around. Tom was famous as a creator of imaginative books of paper dolls, which were sold all over the world, but he was known to us as a witty and charming storyteller. Our meeting[s] were brightened by each new chapter of his autobiography and the occasional patter song from his singing career in New York. I enjoyed the few months of our acquaintance back in 2010. He was always charming and told interesting stories. He had dozens of his booklets on display and for sale at his family's store in Smithville, TX. The artwork was superb and, he had reassured me, the fashions meticulously researched and reproduced. Google Images has hundreds of pictures of Tierney's pages in his paper doll booklets. I wish I had the permissions to copy them here. As it is, I must use the Amazon.com views of his books that I do have permission to post. 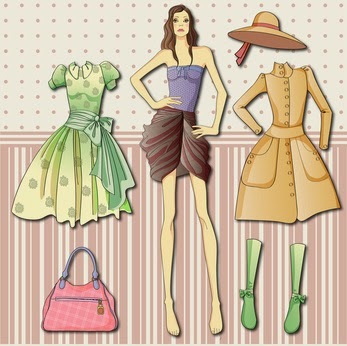 I am including a current day paper doll set by another artist as a comparison of styles. Also, Tierney's focus was always on the fashion of an era or theme; he was a historian in his field of fashion, often adding snippets of history to his booklets, so comparing his historical works to a modern work of fashion doesn't feel disrespectful. Indeed, my intent is to honor him and his place in fashion history.